There are three ways in which you can send an oubound fax with myHEALTHware Fax. Fax directly from SOAPware chart. 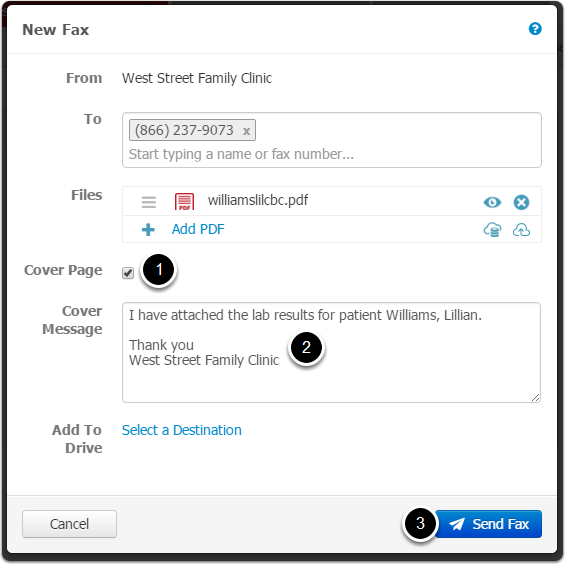 Fax using the myHEALTHware Desktop application. Fax by uploading a document in myHEALTHware Fax. 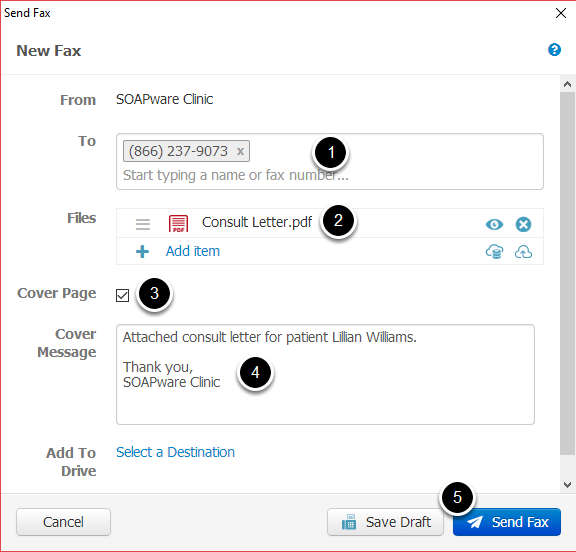 If you are using myHEALTHware Fax, you can fax a document directly from within the patients chart in SOAPware. Simply click the myHEALTHware icon in the toolbar (located in each chart section) and select Send as fax. After clicking the Send as fax option, the Send Fax window will appear with the document you selected attached in the Files section. Enter the Fax number that you wish to send to (or select a myHEALTHware Contact). The files you selected in SOAPware are attached to the fax. Click the View icon if you wish to view the attachment. If you wish to have a cover page on your fax, check the Cover Page box. If you wish to add a message to your cover page, enter the message in the Cover Message box. Click Send Fax to transmit the fax. In addition, you can fax Document Designs directly from SOAPware. Simply open your documentation designs, select the design that you wish to fax. 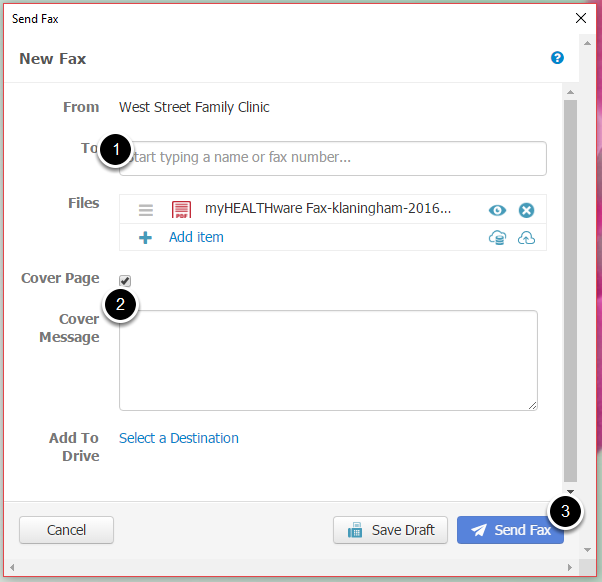 Then click the myHEALTHware icon and choose Send as fax. The fax will be sent to the recipient through myHEALTHware Fax. You can check the status of your sent faxes by going to myHEALTHware. 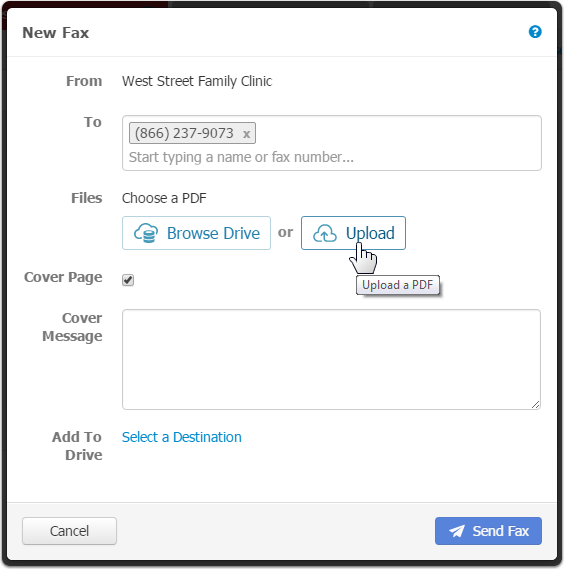 Click on the Fax tab and set your Filter option to view Sent faxes. 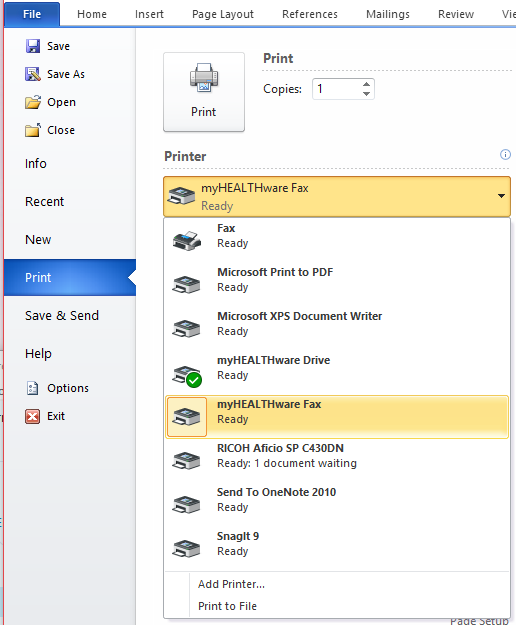 myHEALTHware has created a new desktop application that allows the user to print to myHEALTHware Drive and myHEALTHware Fax from any program on their computer. 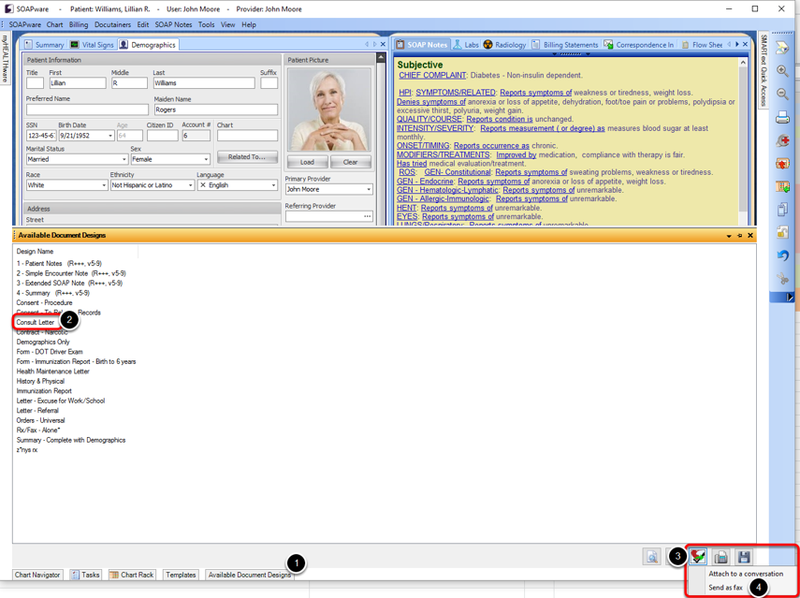 For example, if the user needed to fax a Microsoft Word document, the myHEALTHware Desktop Application allows them to choose the myHEALTHware Fax application in the printer selection dialog. In this lesson, we will cover the steps to print to myHEALTHware Fax. For instructions on setting up and using the full features in the myHEALTHware Desktop application, please see: myHEALTHware Desktop Application (Link Coming Soon!). When inside of another application (such as Microsoft Word), select to Print the document that you wish to fax. 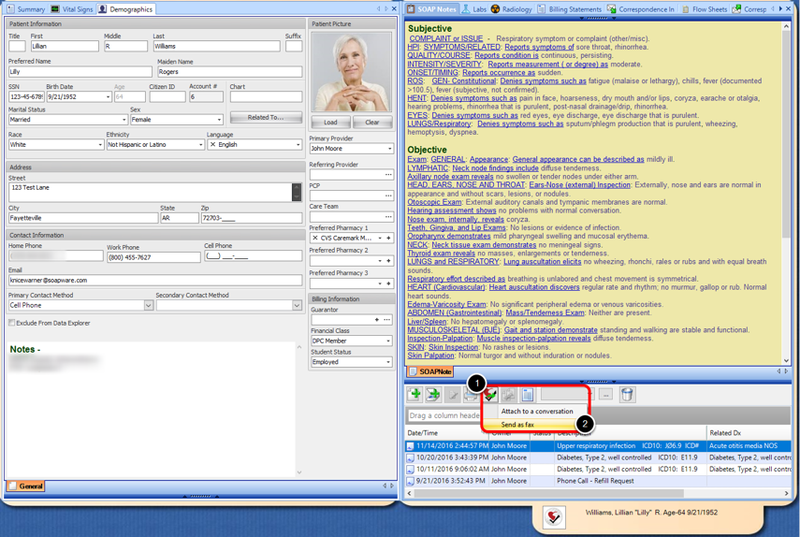 Using your Printer drop-down selection menu, choose myHEALTHware Fax (as seen in the screenshot above). The New Fax dialog will appear. Enter the fax number in the To box, along with a message for the cover page if desired. Click Send Fax to sent the document via myHEALTHware Fax. Click the Fax tab under the My Health panel. In the New Fax window, enter the fax number that you wish to send to. If the fax number is saved as an existing contact, it will appear for you to select. 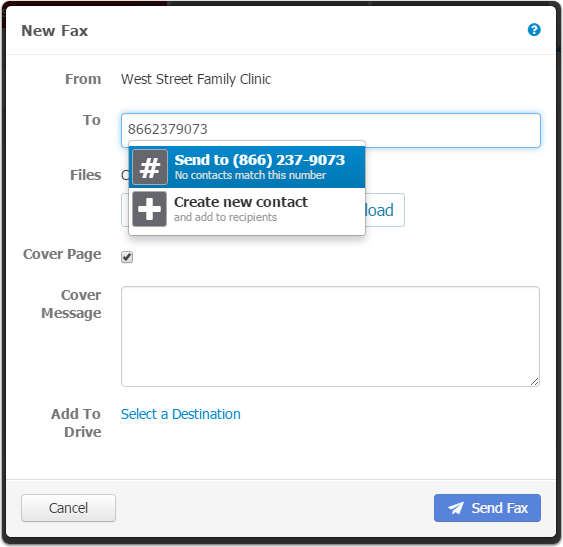 If the fax number is not saved as an existing contact in the system, click Send to # or select Create new contact. Select the file that you wish to fax. The file must be in PDF format. Click Upload to select a file from your computer. 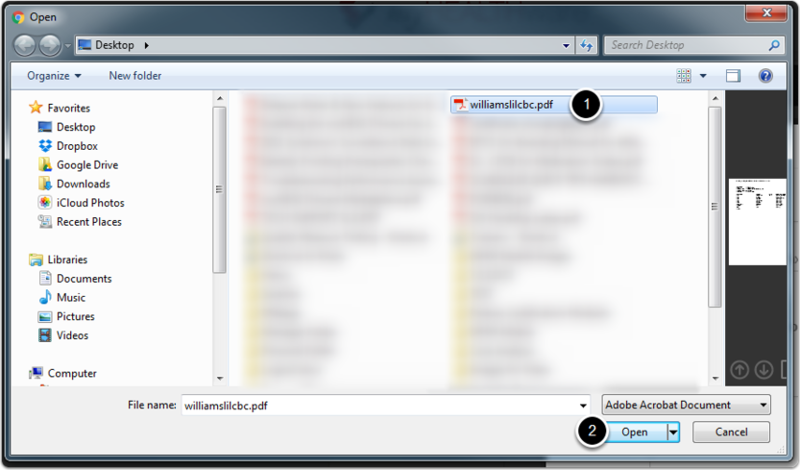 Search your computer to locate and select the PDF file that you wish to fax. If you wish to attach a cover page to your fax, check the button to add a cover page. If you wish to enter a message onto the cover letter of the faxed document, type your message into the "Cover Message" section. Click Send Fax to send your fax to the recipient. Once the fax has processed, thumbnail images of each page of the fax will be displayed. The status of the fax will be displayed in myHEALTHware. Once the fax has been delivered to the recipient, a confirmation status will be displayed. If the fax delivery has failed, a Failed status will be displayed.